The Conair Group introduces its new TrueFeed LQ liquid feeder, which eliminates the need for time-consuming color calibration and adjusts automatically for changes in material and processing conditions. “Introduced several years ago, Conair TrueFeed gravimetric feeders for pelletized materials revolutionized on-machine dosing,” says Alan Landers, Conair Blender Product Manager, “by offering a new standard for accuracy and ease-of-use. Our new TrueFeed LQ feeders are likely to have a similar effect. With improved dosing accuracy, users may find that they can use less expensive color and still get the look they want.” As said, the Conair feeders use the same clean, simple peristaltic pumping technology as conventional volumetric dosers. However, the liquid container is supported on a load cell that constantly measures the loss-in-weight as material is pumped to the processing machine. Conair says programming is easy. In injection-molding applications, the operator simply enters the part weight and the color/additive percentage. For extrusion, the feeder can run on an open loop or precisely control the metering rate against extruder screw speed. Once set up, the digital control takes over, adjusting pump speed to meter exactly the right amount every time, regardless of changes in production rate, variations in viscosity, pump/hose condition or environmental changes. The menu-driven control system includes a real time memory that not only stores up to 1,500 process settings, but also tracks actual dosed weights, providing process validation over time, according to the company. The weighing system has a self-regulating electronic filter that ensures weight information is interpreted correctly even under high-vibration conditions. Control readouts can be presented in any of more than six languages. 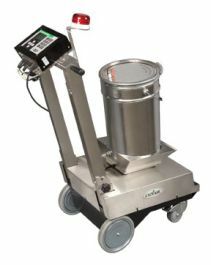 Conair adds that an optional wheeled trolley base can be added to support the liquid additive canister, weigh scale, pump and TrueFeed control, creating a compact, portable metering system.